Precious metals might be the most undervalued asset class today with numerous tailwinds and low long-term downside risk. AAAU offers highly liquid access to securely stored physical gold bullion. AAAU shares are guaranteed by the Australian government and are also redeemable for physical gold coins from the Perth mint. AAAU's storage and management fee is very low, beating all but one gold fund. While its tax treatment is inferior to CEF, its lower fees and easier redemption for bullion make it a better fit for retirement accounts. Precious metals might be the most undervalued asset class today with numerous tailwinds and low long-term downside risk. Backed by millennia as the premier form of money and a stable store of wealth, they have - to borrow a term from Warren Buffett - perhaps the ultimate "moat" protecting their intrinsic value over the long term and have proven to be an ideal safe-haven asset during times of economic and/or geopolitical uncertainty. Additionally, they have several key tailwinds that should push their value higher in the months and years to come. First, new supply coming to market is dwindling. The drop in gold prices off of the highs seen earlier this decade has made it less economical to mine gold, resulting in both fewer mines as well as shorter mine lifespans. This will inevitably lead to less gold production and possibly a supply crunch that would boost prices. Second, U.S. and global monetary policy are very conducive to gold and silver appreciation. The US Federal Reserve's low interest rate policies are propping up an otherwise weak economy while also facilitating record government budget deficits. As US national, state, corporate, household, and student debts continue to soar to new highs, the central bank will feel continued pressure to keep rates low, likely leading to continued negative real rates (interest rate minus inflation rate). Economic history shows that negative real rates are a very bullish indicator for gold. Third, gold is at a decade-low relative to the stock market. 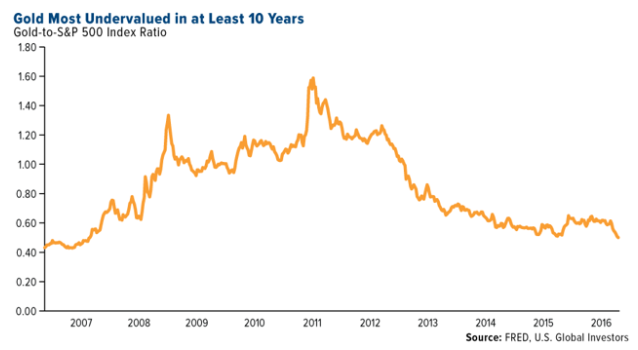 As the chart below indicates, the price of gold versus the value of the S&P 500 Index (SPY) is around a 10-year low. This indicates that, particularly given the aforementioned tailwinds, gold is an especially attractive investment right now relative to other available options. Furthermore, even as its relative price has declined significantly, equity valuations (based on the Schiller P/E ratio) have reached their second highest levels in modern history. As a result, from a long-term perspective, it appears that gold has little room for decline and numerous macroeconomic factors indicating that there could be considerable upside. AAAU provides a highly liquid and cost-effective way to invest in gold. Unlike investments made through private storage companies like Schiff Gold or Mike Maloney's goldsilver.com, AAAU shares are easily and instantaneously liquidated for cash on the public market with minimal frictional costs compared to the storage companies. At the same time, however, AAAU's share are also backed by physical gold secured in central bank grade vaults guaranteed by the Perth Mint, which is fully owned by the Government of Western Australia and operates under the guarantee contained within the Gold Corporation Act 1987. As a result, investors can sleep well knowing that a reputable government is underwriting their holdings of gold. Additionally, AAAU allows shareholders to redeem their shares for a wide range of gold bullion bars and coins from The Perth Mint at any time at rates clearly delineated on their web page. Bottom line: other than holding the gold yourself (which comes with its own set of risks and hassles) AAAU is about as safe as it gets when it comes to owning gold bullion. AAAU's expense ratio is a very low 0.18%. This compares very favorably to Sprott Physical Gold and Silver Trust's (CEF) 0.4%, SPDR Gold Trust's (GLD) 0.4%, and even the iShares Gold Trust's (IAU) mere 0.25%. For perspective, this means that for every $10,000 investment, you save $22 per year by investing in AAAU instead of CEF or GLD. Of course, investors should keep in mind that CEF also stores silver which typically stores at a higher cost, so that is not a perfect apples-to-apples comparison there. The only gold ETF that I have found that goes toe-to-toe with it on fees is the World Gold Shares SPDR Gold Minishares Trust (GLDM), which also only charges 0.18%. However, AAAU enjoys sovereign backing and physical redemption options that GLDM lacks. While I still believe that CEF is the best option for investors looking to gain exposure to both gold and silver in a taxable account, AAAU offers the best risk-reward for gold investors in a tax-sheltered account. This is because it matches CEF in terms of government-secured bullion backing the shares, but crushes it in terms of redemption of shares for bullion (because its redemption flexibility, fees, and minimums are much more favorable than CEF's are) as well as on annual storage/management fees. In addition, though shares are taxed at the collectibles tax rate (for U.S. citizens) as opposed to the potential long-term capital gains rates enjoyed by CEF investors, tax-sheltered accounts nullify this difference between the funds. Precious metals have a very favorable risk-reward outlook today, especially compared to the inflated valuations of stocks and bonds. AAAU provides investors way to invest in a portfolio of gold bullion that is arguably cheaper and safer than any other option out there thanks to the industry-low expense ratio, the guarantee of its holdings by a reputable government, and the ease of redemption for actual bullion. As a result, I think it is an ideal way to invest in precious metals in a tax-sheltered account. To access my “Top Ideas” join us at High Yield Landlord. We are the largest community of Landlords on Seeking Alpha with over 300 members. We spend 1000s of hours and well over $20,000 per year researching the market for the most profitable investment opportunities and share the results with you at a tiny fraction of the cost. Join Us Today Before Price Increase! Don't let tenants, toilets and trash ruin your life. Beat the price increase and become a “Passive Landlord” with our 8% yielding diversified Real Estate Portfolio. Disclosure: I am/we are long AAAU, CEF. I wrote this article myself, and it expresses my own opinions. I am not receiving compensation for it (other than from Seeking Alpha). I have no business relationship with any company whose stock is mentioned in this article.